Track 1-1 digital piano recorded on 15th February 2002 in Brixton, London. Track 1-12 recorded in February 2002 in Göteborg. Track 1-13 recorded 18th October 2001 at the Blue Tower Studios, Stockholm. Track 1-15 recorded in Oslo. Mastered at Studio 29, Stockholm. Track 1-16 recorded at Studio 1, Kolsyrefabriken, Stockholm, 18th January 2002. Track 1-19 recorded at EMS, Stockholm, 2002. Track 1-21 recorded on 30th March 2002 in Thessaloniki. Track 1-23 recorded in Caen, 14th April 2002. Track 2-7 recorded on 26th May 1996 at the Thomas Nordanstad Gallery, New York City. Track 2-9 "I found these sounds lying around..."
Track 2-11 New York City, 16th January 1938-Stockholm, 14th April 2022. Tracks 2-17 to 2-20 Berlin/Havana/Santa Barbera, 2000-02. Dedicated in gratitude to my favourite monkey. Track 2-21 recorded in Fylkingen, Stockholm, 26th January 2002. Track 2-24 with thanks to Dirk Smorgasbord. Double CD in oversized plastic wallet with two card inserts and KREV flag & Elgaland Vargaland logo stickers. "Published this day the Twenty Seventh of May Two Thousand and Two by Ash International in conjunction with the 10th anniversary celebrations at Lydmar Hotel, Stockholm." From the sleevenotes: "This release marks the tenth anniversary of the moment when. 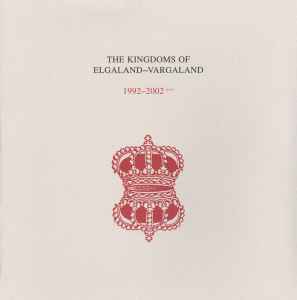 at 12 noon on 27th of May, 1992, the State Of Elgaland-Vargaland was proclaimed by Leif Elggren, founder of Elgaland, and CM von Hausswolff, founder of Vargaland."